My name is Anne and I’m a full-fledged Pinterest fail. I’ve tried to fight it, I mean I follow the directions but for some reason the way the pretty food/craft/clothing looks on Pinterest never translates once I try to make it. In case you’re wondering what’s made me write about this it would be the salsa I made today. 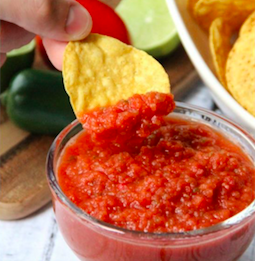 I mean, it looked like an easy recipe (which it is) and the photo showed off one of the most mouth-watering bowls of salsa, just like the kind you get when you go out to a Mexican restaurant. I’ll be honest, I was wanting to cheat my usual “hand dice all the ingredients” method so I went to Pinterest hoping to score a recipe using our NutriBullet. Here’s what the photo showed me my end result would be. It looks amazing, right? I am a huge fan of Mexican food, so I was riled up and ready to try this out. Now let me show you what I got after I tried to make this recipe. Okay, a little more info for you guys, I’m pretty sure I could have used more tomatoes and there are no jalapenos - I had to work with what had in the fridge. Come to think of it there wasn’t any cilantro either… basically, I know this is 100% ALL MY FAULT, cause it’s how I roll. Some days it works while some days, like this time, it doesn’t. My photo doesn’t quite show off the pink hue that came out after I was done blending this bad boy. Seriously, I was so pleased with myself as I was making this! I gathered the ingredients, added them to the NutriBullet and turned it on to pulse. Imagine my surprise when I saw it blending itself into a lovely frothy, Salsa Daiquiri. I do think I’ve created the next big thing in frozen cocktails if nothing else. If I poured it in a jar it would look like strawberry vinaigrette. I’m pretty sure this won’t be the first fail I’ll share with you - lucky you weren’t around for my DIY deodorant I tried to make 2 years ago. I was so excited about it, it worked great for about 4 days. Then I woke up with painful bumps under my arms - excruciating pain! I was so confused what had happened so I asked a friend (who is THE authority on skin care in New Zealand) and she politely told me I had burned my armpits… which is hilarious albeit painful in and of itself. Lesson learned? I think not. I’m currently planning next week’s dinners on a Pinterest board. Isn’t my husband a lucky man? Do you use Pinterest? Have you ever tried to make something, like a special birthday cake or a Unicorn smoothie, or tried a DIY beauty tip only to have it fail in the most glorious way possible? If you have, let’s celebrate it! Tell me about it in the comments and we can make each other feel better.